with cream cheese filling ... and a stuessel topping ... you can thank me later. There is no better way to kick of Autumn 2011 than with a little pumpkin spice. The trees may not be as colorful as by Jess, but I've taken her little pumpkin's older brother and made something delicious. These moist muffins hold a surprise inside, a dollop of sweetened cream cheese. Words cannot describe, you just need to venture forth and back a couple dozen. I'm sure your friends and family will happily taste test. I made this recipe last year and immediately added it to the recipe box, but forgot to note where I grabbed it from online. I was able to hunt down the original over at annies-eats.net. Check it out –> here. Confession: my grandmother never made these cookies. But whomever's g-ma figured this recipe out should be given an award. I'm thinking one of those ceramic "World's Best Grammy" mugs. 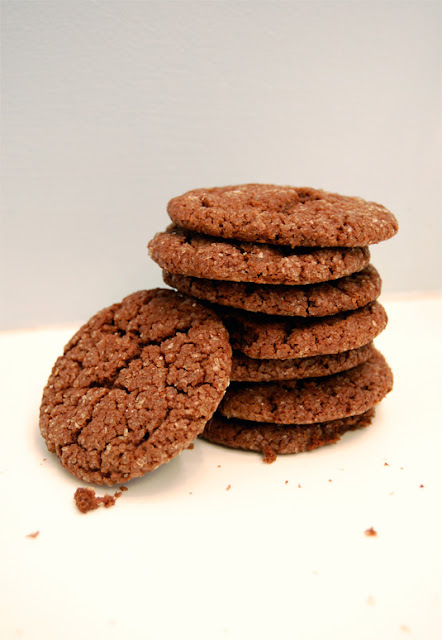 With their deep chocolate flavor and sugary coating, these cookies bring you back to preschool. More precisely, to the package of cellophane wrapped, giant chocolate disks that some unassuming mother would bring for snack day, making the 3pm nap a pipe dream. There's something nostalgic about the flavor and texture combination that makes these a favorite for all ages. Rolling each cookie into a ball is a pain. However you will notice the lazier you get, the larger the cookies become.. and the more delicious. Make sure you buy a fresh gallon of milk before baking! It is coming... FALL! I couldn't resist any longer. 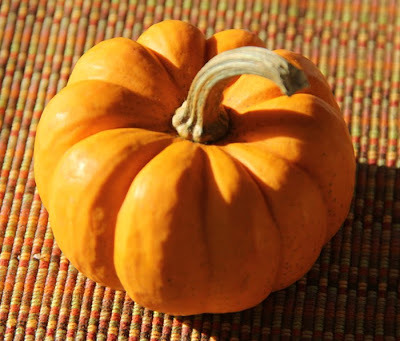 I bought my first little pumpkins of the season. Next stop, apple picking. Now if I could only find a free weekend! Isn't the little guy cute! There is nothing more satisfying then a hot, creamy bowl of soup on a rainy day. One of my challenges this fall and winter is to learn how to make more homemade soups. They are perfect for freezing and to have multiple meals during the week. The White Bean & Garlic Soup was my first attempt at a new soup recipe and, might I say, it was a success! 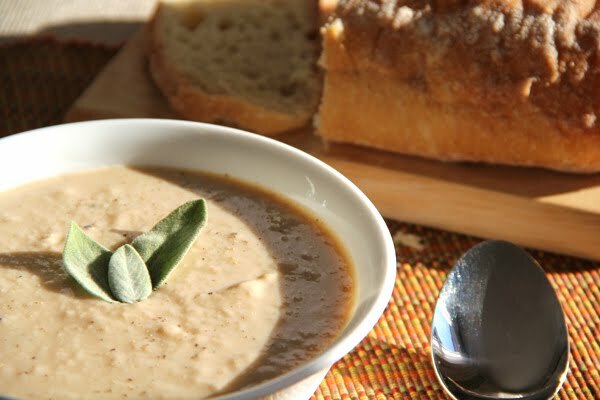 This bean soup is super easy and quick. Great for weeknight cooking that hits the spot. Place a medium pot over medium heat. Add the butter, olive oil, and shallots. Cook and stir occasionally until the shallots are softened, about 5 minutes. Add the sage and beans. Add the chicken stock and bring the mixture to a simmer. Now add the garlic and simmer until the garlic is softened, about 10 minutes. Turn off the heat and using an immersion blender blend the soup until it is creamy with no lumps. Turn the heat back on, add the cream and pepper. Heat until warm and ready to serve. Enjoy! Time to up the culinary game. How you ask? That's right, no banana quick bread here; I brought out the big guns (well, more like the unicellular). Sure, it doesn't go from bowl to belly in less than an hour. Sure, you're working with a fickle, living, breathing organism. But nothing makes a house smell more cozy and inviting than fresh baked bread (close second: roast chicken or roaring fire). 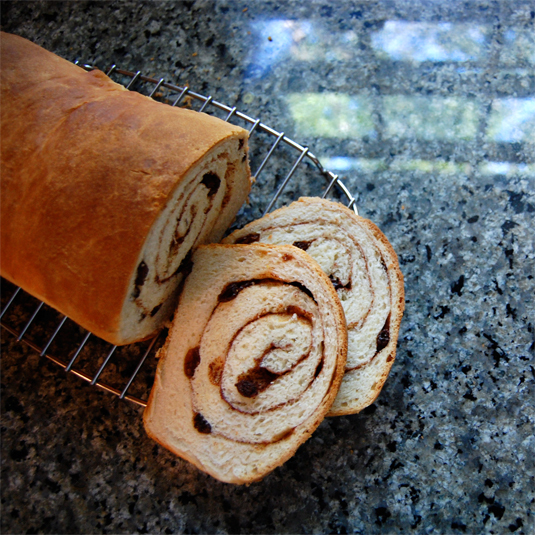 Tossing in raisins and cinnamon just ups the comfort level by a factor of 10! Fresh out of the oven, this loaf is killer. Toasted with butter - whole new experience. Home made is so much heartier than those flimsy Pepperidge Farms slices you buy at Costco. Make it yourself and you can saw off giant slabs, unraveling the fluffy goodness from the napkin on your lap. Getting out a plate is wasted effort because this won't be eaten at a leisurely pace. But be warned: this bread disappears fast. I had grand plans for Saturday morning french toast, but little did I know this bad boy would only survive a couple of days on the counter of a busy kitchen. Oh well, guess I'll have to make it again! Put yeast in small bowl, toss in the pinch of sugar and stir in 1/4 cup of warm milk. Let rest for 3 minutes, then stir. With a stand mixer fitted with paddle attachment, combine remaining 1 cup milk, the butter and remaining 1/4 cup sugar. Mix on low speed for a minute or two. Add the salt, egg, vanilla, orange zest and nutmeg and mix for a minute; mixture will look curdled. Add the yeast and beat on low speed for 1 minute more. Turn the mixer off and add 2 and 3/4 cups of the flour, mix on low until you work the flour into the liquids. Now is the time to switch to the dough hook attachment. Add another cup of flour and increase speed to medium, beating dough for a couple of minutes. If the dough does not come together and clean the sides of the bowl, add an additional 1/4 cup of flour, 1 Tbs at a time. Keep the mixer at medium speed and kneed the dough for 3 minutes, or until dough is smooth and has a nice buttery sheen. The dough will be very soft, much too soft to knead by hand. Butter a large bowl, turn the dough into bowl and cover tightly with plastic wrap. Put the bowl in a warm place and let the dough rise until doubled in size, about 1.5 hrs. Butter a 9x5 inch loaf pan. Whisk together sugar, cinnamon and cocoa. Roll dough into a 12x18 inch rectangle on a lightly dusted surface. Gently smear 2 Tbs of butter over the surface of the dough with your fingers. Sprinkle over cinnamon sugar mixture then scatter the raisins over the surface. 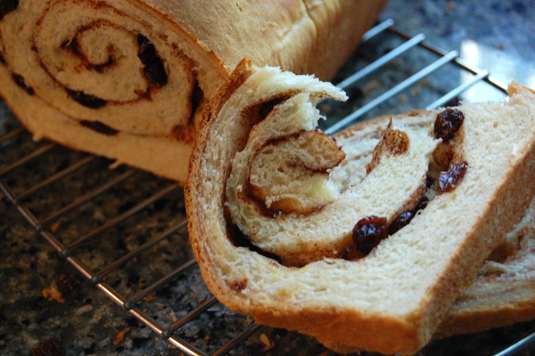 Starting from short side, roll the dough up jelly-roll fashion, making sure it is nice and snug. Fit dough into buttered pan, seam side down, and tuck ends under loaf. Cover pan loosely with wax paper and set in warm place; let dough rise until it comes just a little above the edge of the pan, about 45 minutes. When dough has almost fully risen, center rack in oven and preheat to 375 degrees F. Line baking sheet with parchment. Melt remaining tablespoon of butter and brush on the top of the loaf. Put the pan on baking sheet and bake bread for 20 minutes. Cover loosely with foil tent and bake for another 25 minutes or so, until the bread is golden and sounds hollow when the bottom of the pan in tapped. Transfer the pan to rack and cool for 5 minutes, then unmold. Invert the bread and cool to room temperature right side up on rack. Good Morning! I don't know about you but sometimes I am craving something more than a bowl of cereal or some eggs. As these brisk mornings approach I want something satisfying and hot out of the oven. 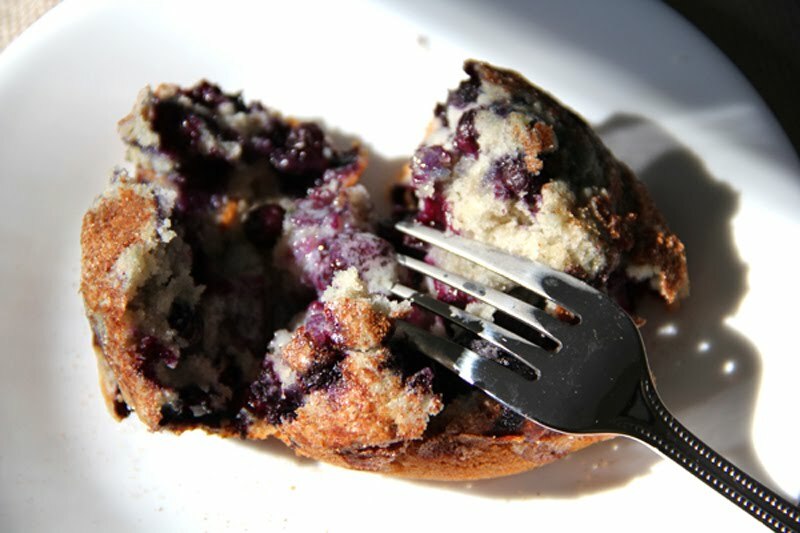 What better than a warm homemade blueberry muffin. I've struggled to find a decent recipe for your basic blueberry muffin. Alas, I stumbled upon one on the world wide web. It was, however, missing what I find to be some of the key ingredients in a muffin. Spices! After a few tweaks this recipe is ready for all those brisk mornings and a hot cup of coffee. Enjoy! Heat the oven to 375 degrees. Grease a 12 cup muffin tin. In a bowl, mix butter until creamy. Then add sugar and mix until fluffy and pale. Add eggs one at a time, beating after each. Then mix in vanilla, baking powder, salt, cinnamon, and nutmeg. With a spoon, fold in half of the flour then half of the milk into the batter, repeat. Fold in the blueberries. Then distribute the batter into the 12 muffin cups. You may have extra batter. Top each muffin with the topping. Bake 20 to 30 minutes until golden brown and springy to the touch. Add a little butter and enjoy! 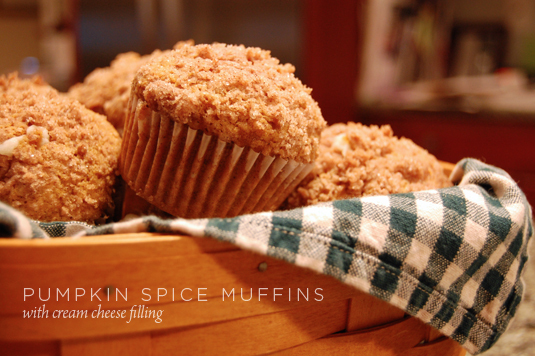 This recipe makes 18 servings and most people only have a single 12 cup muffin tin. I decided to experiment with my extra batter and found another fun way to bake these muffins up to make them extra special. I baked the extra batter in single serving ramekins and added old fashioned rolled oats with a little bit of butter to the topping before baking. The presentation looks great and it tastes amazing! While out and about last weekend I couldn't help but notice my first foliage siting of the season. 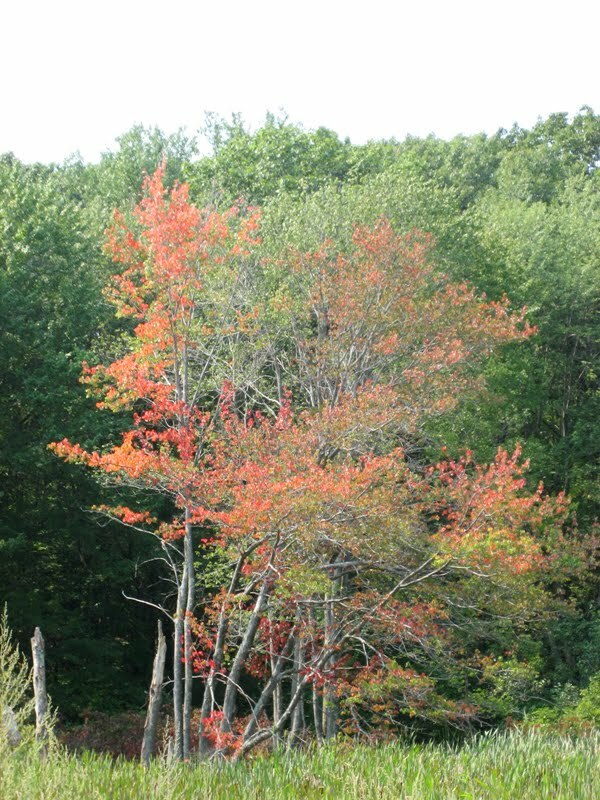 A lone birch had transformed its vibrant greens into warm hues of orange and red. That's right, the trees have officially begun changing in New England. As the day went on, while driving up Route 93, I had even noticed a few more. Below was the first tree I had sighted and I needed to share it with you. Autumn is upon us. Get those apple picking, pumpkin carving, trick-or-treating, turkey carving hands ready! I hope this gets you excited for fall! In honor of Fashion Week ... enjoy! As Mere was baking while waiting for Irene, I was spending time with my Mom. She came up to visit for the weekend and to help me prep for the Hurricane. As we hunkered down inside the house that Sunday I whipped out some good storm soup from the freezer. 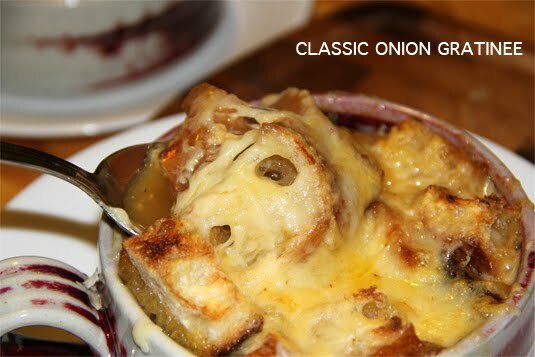 I had frozen a batch of Classic Onion Gratinee soup and figured what is better on a windy and rainy day. All it needed was a little heat, some hearty bread, and gooey cheese. 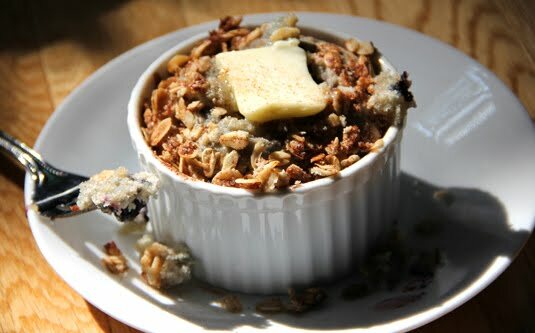 Mom and I actually came across this recipe last summer at Cafe Noir which was located in Providence, Rhode Island. I say was because they have apparently gone out of business since then. Luckily they gave us their soup recipe! The recipe is good as is but I have found ways to make it a little more flavorful and easier to eat. I add an additional onion, garlic clove, and thyme sprig, the onion adds heartiness, the thyme and garlic add more flavor. I have also found it is easier to use cubed bread in the soup which makes it easier to eat with your spoon. Last but not least, I shred the cheese so it fills every nook and cranny. It also melts better. The recipe is supposed to serve 6; but I find it serves about 8. It really depends on how large your bowls and tummies are. Enjoy! Julienne onions, sweat them in butter over medium heat until wilted and translucent, about 10 minutes. Add garlic, turn heat to high to caramelize onions. Stir constantly to avoid burning. When onions achieve good color, deglaze pot with wine and cook for about 1 minute. Add chicken stock and thyme sprig bouquet. Season lightly, simmer for about 15 minutes. Remove thyme and season soup to finish. Ladle soup into over proof bowls. Place 1 slice of bread atop each soup and cover with 2 slices of gruyere cheese. Place soup bowls under broiler for about 3 minutes or until the cheese is bubbly and beginning to brown. Enjoy carefully, bowls will be very hot! Two sisters living in two separate states, TALBOT Taste is our venue to share with each other and the world all we find inspirational, interesting and just plain gorgeous.